All about the Oracle Database….and whatever else I decide to write about…. This is the final part of a multi-part blog post on using OpenLDAP for Net Service Name Resolution. Part 1 can be found here. 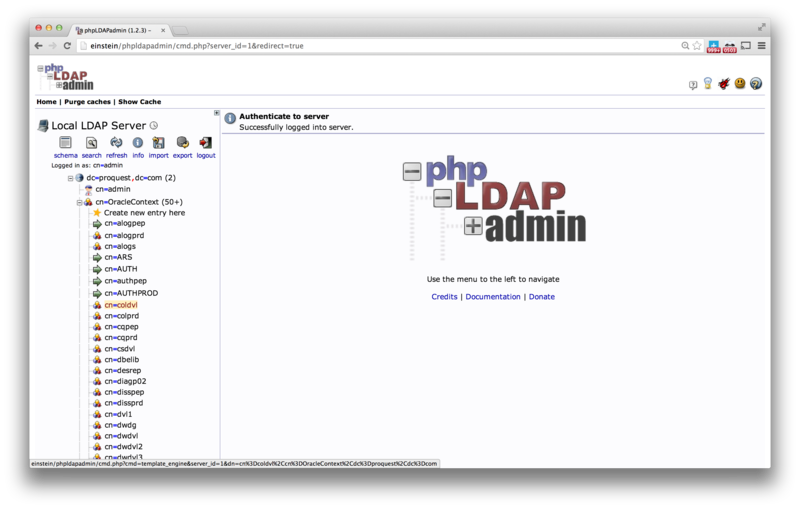 Ok, now that you have installed and configured phpldapadmin, you’ll want to do some customization, that will facilitate using phpldapadmin specifically for maintaining Net Service Names. 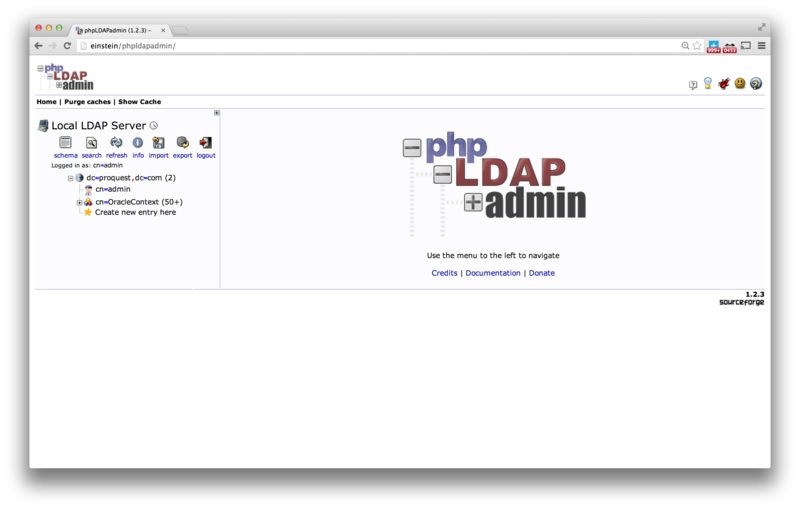 Remember, phpldapadmin is a generic tool, that can be used to manage any LDAP server, with virtually any type of content. At this point, you can use it to manage your LDAP server, but, I’ll provide you two new custom templates, for managing Net Service Names and Net Service Aliases. So, this shows all the default templates that phpldapadmin provides. Exactly none of these are useful for maintaining Oracle Net Service Names and Aliases. Furthermore, to add a Net Service Name or Alias, you’ll need to choose the ‘Default’ template. 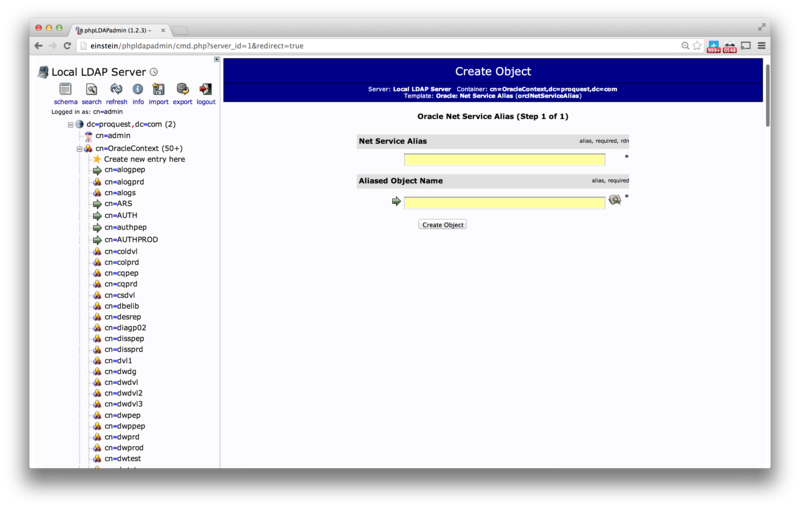 This is a difficult and cumbersome way to interface with the LDAP server. So, what to do? So, now, to disable the standard templates, and display only the templates specific to Net Service Names and Net Service Aliases, you’ll need to edit the /etc/phpldapadmin/config.php file. 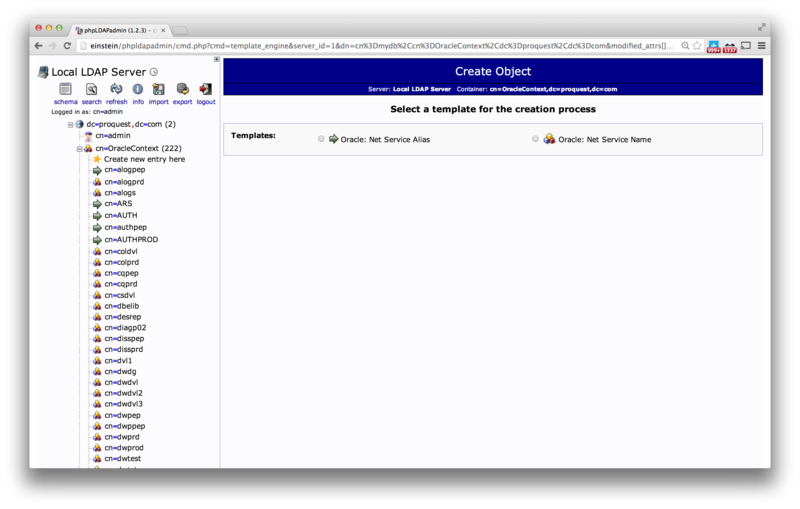 So, now we only see the ‘Oracle: Net Service Name’ and ‘Oracle: Net Service Alias’ templates. This should greatly simplify the task of adding Net Service Names and Aliases, as it removes a bunch of stuff you’ll never use, and adds specific templates for the two types of objects you’re interested in. Note the format of the Aliased Object Name. Also, note that you can use the icon with the magnifying glass on top of the file folder to open a window where you can browse and navigate through the Net Service Names that have been defined. So, this concludes the setup of OpenLDAP for Oracle Net Service Name resolution. You have installed OpenLDAP and configured it for Net Service Name resolution. Optionally, you have set up simple Master/Slave replication. You have the tns2ldif filter for large scale importation of your enterprise-wide tnsnames.ora file, and finally, you have installed the phpldapadmin tool for GUI-based editing of individual Net Service Names and Aliases. This should be a complete solution for enterprise-wide Net Service Names resolution. If you have any questions, comments, or problems, feel free to leave a comment below. 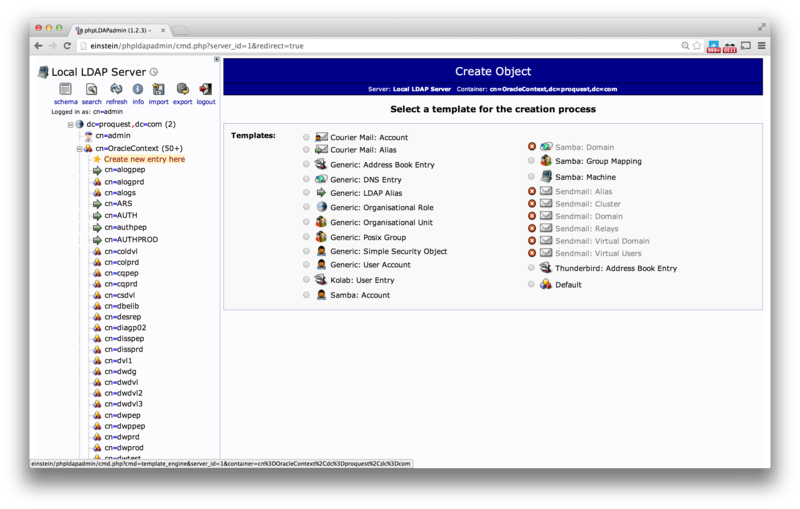 This entry was posted in LDAP and tagged LDAP OpenLDAP OID tnsManager. There is also a product called TNSadmin Web Manager GUI for the same purpose at http://www.tnsadmin.com, runs in a Tomcat container and contains REST API for automation tasks. Thanks Martin, I was not aware of that product. Discussions about Oracle performance tuning, RAC, Oracle internal & E-business suite.